This is a Wild Animal Party Favor Pack. 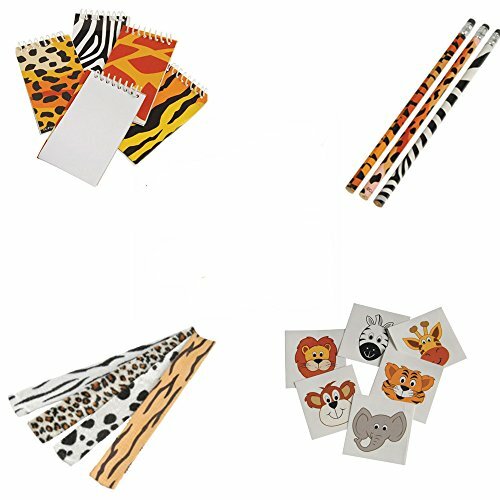 Includes an assortment of 144 Wild Animal Temporary Tattoos, 12 Mini Notebooks, 12 Snap Bracelets, and 12 Pencils . Perfect for goody bags and favor boxes. Notebooks are approx 15 pages and 2 ¼" W x 3 ½" T. Pencils are 7 1/2 in. L.. Snap bracelets are assorted styles in a plush cloth design and are 9 in.L x 1 in. Wide.